Hello, all! The Tarot cards for today are the Seven of Wands (Challenges) and Strength (Angel of Courage). There may be a lot of energy invading your space and affecting you in a way that is difficult to handle. This may come in the form of conflicts with other people or you may be at war with yourself. This can play out as guilt, shame, or depression. 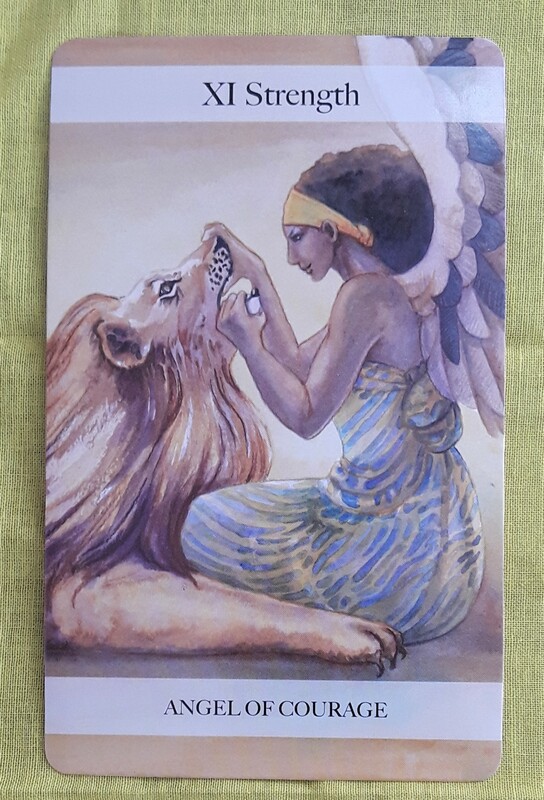 The Strength card is a reminder to have the courage to face theses challenges with love, inner strength, and patience, while at the same time standing your ground and honoring your own needs. Today’s tarot card is Strength. Things in your life may feel (or even be) a little unsettled right now, especially with the energy of Friday’s lunar eclipse swirling around. Even in the larger world around us, we have political controversies to try to understand and extreme heatwaves gripping several parts of the world, among other crazy things. With all of this going on, the Strength card is reminding us to hold steady. Calm your impulses of anger, fear, and aggression and try to understand where these feelings are coming from. Instead of reacting blindly, embrace your own humanity. You don’t have to conform to any ideal of “perfection.” You are beautiful as you are. If there are things you would like to change about yourself, you can do so with self love, self care, and compassion for self. And whatever circumstances you are in, you can deal with them mindfully in a way that benefits your greatest good. Today’s Tarot card is Strength. The beginning of the new year usually brings with it a lot of energy. This year in particular has had some heavy astrological influences that has affected us collectively. So it may be that you have had to a struggle within yourself to fight off your demons. Those demons could come in the form of self doubt, guilt, worry, and the like. You also may have had a few outer demons in the form of pressure from work or conflicts in relationships. Simply put, the Strength card is a reminder to hang in there because you truly have what it takes to overcome these challenging feelings. The key is not to beat yourself up but rather to treat yourself with compassion. Those demons are not really demons but a natural part of being human. Let go of your need for perfection and accept yourself as you are, which is more than good enough. The card for today is Strength. Sometimes the holidays bring out the best in us and sometimes they bring out the beast in us. So have compassion. You are not always on your best behavior, no matter how hard you try. Sometimes you are triggered to behave badly. It’s called being authentic, if you keep in mind that your authentic self is not always your best self. Another word for being authentic is being human. See the humanity in others even when they are behaving badly. Love and kindness is often the way to turn the situation around. And if not, maintaining your core strength of love will at least keep you serene and sane. Hi, all. 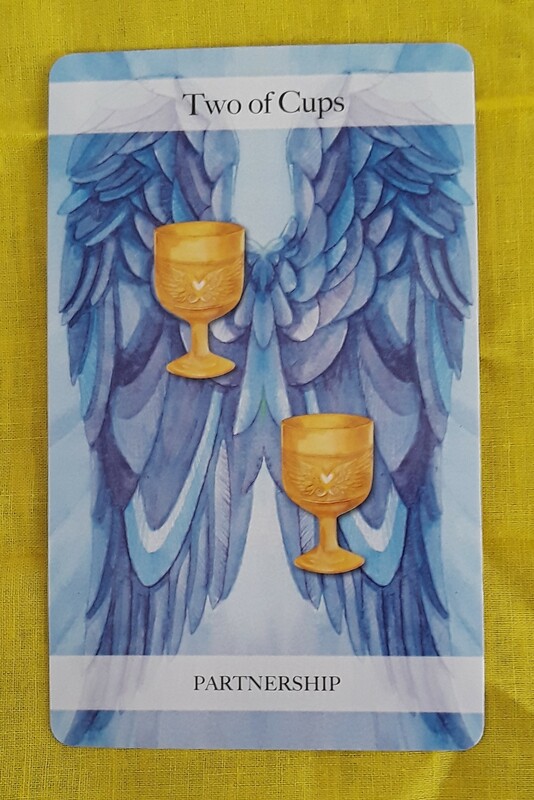 The card for today, Saturday, and Sunday is Strength. 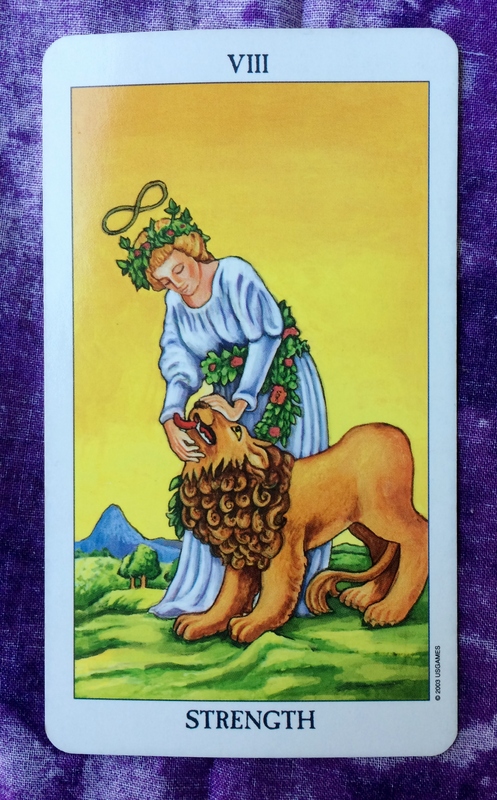 The lion shown in the Strength card represents our basic instincts. Although these primal desires can appear to be dangerous, they actually guarantee our survival on the planet we live on. 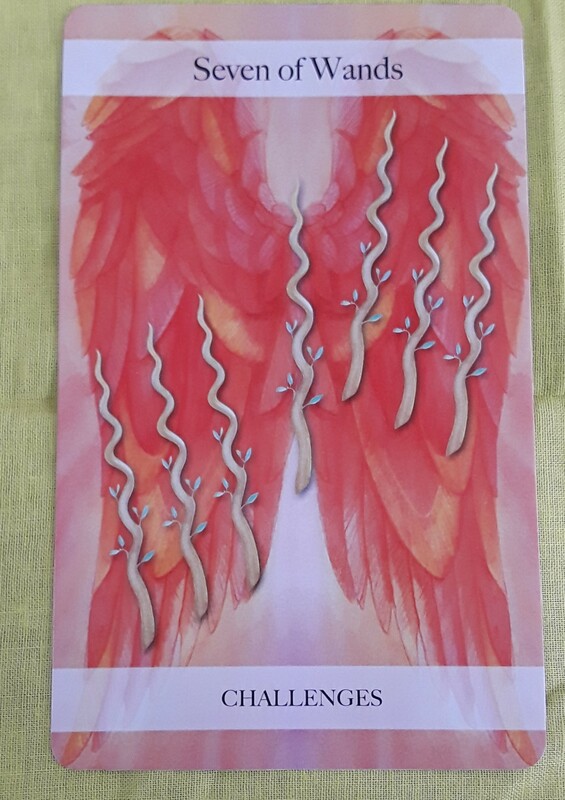 The person shown in the Strength card represents our higher selves. Although we all strive to rely on a higher consciousness, wisdom is empty if it is not grounded in basic human experience. Each of us has a higher consciousness and each of us have primal instincts. None of these are superior to the other. They are all equal and are meant to work in harmony with each other. 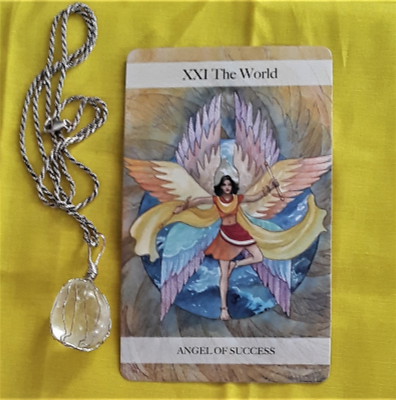 So, take steps to achieve balance with the strength, love and understanding of your higher self, as well as the strength, groundedness, and passion of your basic instincts. Integrate the two sides of yourself and have a great weekend. The card for today is Strength. It is no accident that this card was drawn for two days in a row. This shows that whatever the influences that are affecting our lives lately are still being resolved. So hang in there and continue to tame difficult situations with love and inner peace. You may have to bite your tongue, or better yet, speak without losing your temper. If people in your life are being mean, remember that it has nothing to do with you. They are going through their own issues. Sometimes you are the one who is being unreasonable. At the end of the day, no matter what beastly things we do or say, we are human. Today is the new moon in Libra, which will highlight what is out of balance in our lives. It will show us exactly what we need to do to get the balance we need. Pay attention and try not to resist if a necessary change is making itself known. Today’s card is Strength. If the people and situations in your life seem to be as unruly as wild beasts, don’t be scared. Meet everything with a calm confidence. Show some love and understanding. They won’t have any choice but to respond to you in a similar manner. If you are feeling conflict within yourself, use mind over matter to calm your panic. Don’t give knee jerk reactions to anything. Before you say or do anything, take at least a few seconds to figure out a better way to deal with the situation. The greatest position of strength is when you are balanced body, mind, and spirit.